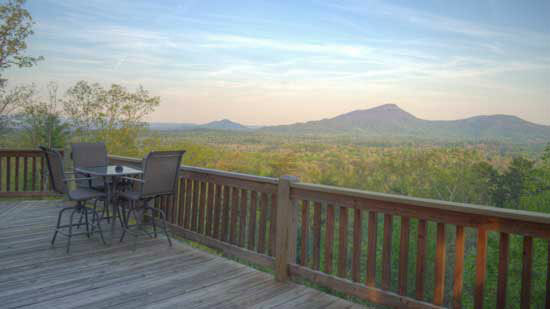 Four Seasons is a deluxe, romantic cabin rental near Helen, GA, with beautiful mountain views. Located on a private paved mountain road, Four Seasons offers luxury, comfort, and a truly unforgettable experience! Soak in the beautiful mountain views from the large jetted spa tub in the Master bedroom. Or cozy up by the fireplace in the living room and enjoy your favorite shows on the flat screen TV. 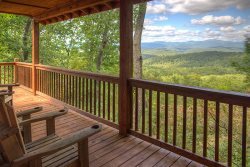 Enjoy the abundance of wildlife in this vacation cabin rental near Helen, GA. You'll see lots of deer as they come down the mountain each evening and pass by the cabin to the 8-acre stocked Patton Lake below (a short drive or nice walk from the cabin). Relax and take it all in from the back deck, or bring your rod for some great bass fishing! The lower level offers plenty of diversion and entertainment! A built in bar, Regulation Pool Table, Satellite TV, DVD and CD Player to play your favorite tunes, or just curl up on the over-sized sectional and read a good book. Step out to the 4 person hot tub on the lower deck, with lounge chairs to relax and enjoy the beautiful mountain vistas. Spa robes are also provided for your use while staying with us -- great for those chilly evenings when hot tubs are a must! Although you may not want to leave Four Seasons, the Bavarian village of Helen, Georgia is only 7 miles away with it's many restaurants, shops, and entertainment! Four Seasons is also conveniently located to some of our wonderful local wineries - 3 miles from Yonah Mountain Vineyards and 4 miles to CeNita Vineyards! • Paved roads and short gravel driveway, accommodates up to 2 vehicles. • Four Seasons is approx 8.5 miles from Helen! Ashley, answered the phone. We had arrived about 2:30, check in at 4PM She let us check in early. Told us GPS signals were not very good, followed written directions and we had no problem. Great property, will be back again. Beautiful, peaceful, was exactly what we wanted and needed. Thank you all. I made a few calls to ask questions and they were very friendly and always checked back if we needed anything else. I want to thank the Pinnacle Cabin Rental Company. They take excellcent care of their properties. The way the cabin was built amazed me by the special touches that were made, windows, wood work, high ceilings, the wrap around proches, and location. We have great pictures, memories, and such a great vacation at the Four Seasons we will definitely be renting from Pinnacle again. The sweet lady at pinnacle cabin was wonderful! I told her what we were looking for and she matched each one! This property was the Best. Absolutely what we was looking for. Very clean cabin n privately wooded. We had no problem enjoying the nature outside. When I visit again this is the cabin I perfer. Loved it inside n out. All was done through email. No issues. Four Seasons is an adorable cabin at end of a little mountain road. It is furnished with all the necessities and very well maintained. We were very impressed with how clean the property was. The look and feel for the property was exactly what we were looking for, it gave us a prefect escape. We did not speak with anyone directly. However, the emails and directions were very thorough. Four Seasons is a nice little cozy place for a couple to stay and get away from work and business. It is close to hiking, good eating establishments, and shopping. The cabin was very quiet and cozy. It was also very clean and had everything we needed for an enjoyable stay. I would come hear again in the future. This property was amazing. Very clean and well maintained. We will definitely be returning. The cabin was very clean and very well decorated. The view was amazing and the location was perfect. Will will be back to stay again. Just perfect for a couples getaway. Perfect size. Gameroom awesome. LOTS of deer very close to cabin. Veiw for the bed in the mornings GREAT! The team was great to work with... prompt and friendly. We had a great time in Helen last week. My wife said this was the best cabin we have ever stayed in. Not too big and still plenty of room and everything we needed. We were surprised by the great view and enjoyed the peace and quiet. We plan to come back again. Pinnacle obviously cares about their property and the comfort of its guests. Easy to deal with and I would not hesitate to recommend using them. Thank you for a wonderful experience!